I keep a nice double-digit variety of bourbons at my house, but never more than one bottle of any particular bourbon. The only exception has been Jefferson’s Presidential Select 18 Year Bourbon, of which I currently have a stash of three unopened bottles. And even though they run around $100 apiece, I’d probably pick up a few more if I came across them. So while it’s an understatement to say I’m a fan of this bourbon, that’s not the whole reason why I always do a quick scan for “JPS 18” in a liquor store. These days, Pappy Van Winkle may still use 100% Stitzel-Weller bourbon for its oldest bourbons (20 and 23, as of 2011), but the younger varieties use bourbon made at Buffalo Trace. Jefferson’s Presidential Select 18 (which was preceded by a 17 year variety, and will be followed by a 21) is 100% Stitzel-Weller. It’s also all sold out, although you may find some on a few shelves. In other words, it’s rare and old (18 years is very old for bourbon, even if it is only slightly past middle-age for scotch). But being very old and rare doesn’t do much for me, unless it’s also very good. And the 94-proof spirit has that too. The deep copper-colored bourbon has a nose that reminds me of aged rum, with vanilla, dates, cake-batter, and wood. On the palate it really shines with an intensity that combines lots of oaky woodiness with a silky sweetness of toffee, dried fruit, and just a hint of citrus apples. The finish is long and balanced, with more toffee, wood, and resin. It’s a flavor rollercoaster that shows the best of well-aged bourbon without the downsides that sometimes manifest as over-the-top oak or dry spice. 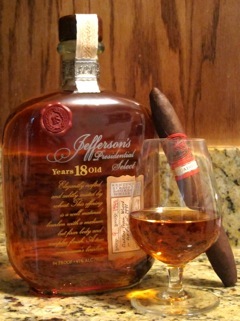 As such, it requires a cigar that is equally well-balanced but still flavorful. The two that specifically fit that bill are the Padrón Serie 1926 Maduro and the Arturo Fuente Añejo. Now $100 is a lot to spend on single bottle of bourbon (think how many excellent bourbons can be bought for half that much), which makes it something of a special occasion indulgence. Still, there’s a highly limited supply (it’s all been sold to retailers at this point) and the upcoming 21-year-old edition will certainly be even more expensive. Which is why I’d suggest serious bourbon fans scoop up a bottle or two if they get the chance. I know I will. I just picked up a bottle of the 17 year old at my local liquor store in Reno and then subsequently bought 8 bottles of the 18 year old at various bevmo locations in roseville and auburn CA. There are still a few left and yes this Bourbon is well worth the $100 price tag.